During the summer, I don’t tend to crave rich, warm chocolatey desserts as much as I do during the winter. It’s not that I would say no a chocolate chip cookie (who would? ), it’s just that I prefer to have something a little more refreshing. Homemade ice cream, fruit cobblers, and anything involving lemon are some of my favorites. 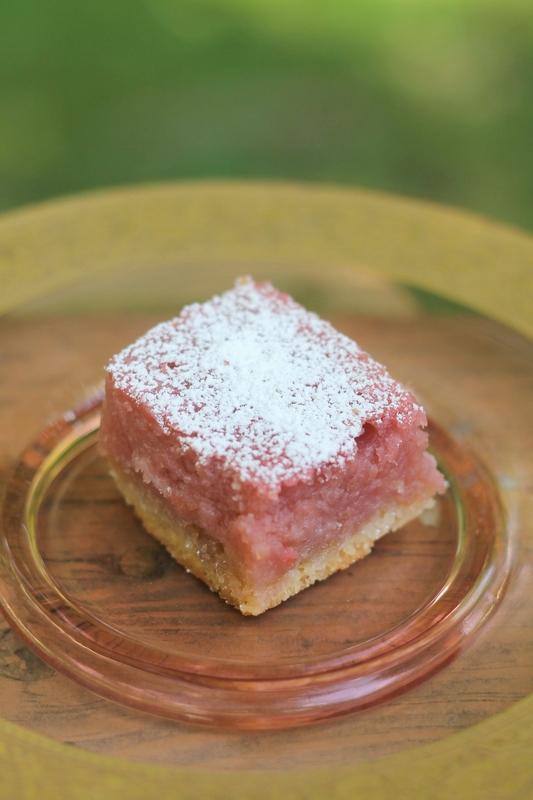 I have always been a lover of lemon bars, so when I saw this raspberry version, I knew I had to try it. It did not disappoint. I love raspberry lemonade, and these bars definitely reminded me of it. There is still the zesty lemon flavor, but also a fruity sweetness from the raspberries. If I had one complaint about these bars, it would be the color. That’s partially my fault though- I was a little short on raspberries so my bars were not as deep of a pink as the source’s were (however, the flavor still came through really well). Though they may not be beautiful, I can guarantee that I will be making these bars again throughout the summer. In fact, I have a craving for one right now as I am writing this. I better go remedy that and make some more! Preheat the oven to 350˚ F. Line a 9 x 13-inch baking pan with parchment paper. Place the butter and sugar in the bowl of an electric mixer. Beat on medium-high speed until smooth, 1-2 minutes. With the mixer on low speed, add in the flour and salt and mix until just incorporated. Press the dough into an even layer over the bottom of the pan. Bake for about 25 minutes or until light golden brown. Remove from the oven and let cool slightly. Keep the oven at 350˚ F.
Meanwhile, combine the sugar, flour, lemon zest and salt in a large bowl and whisk to blend. Place the raspberries in a fine mesh sieve and press through, mashing with a spatula, to extract as much juice and pulp as possible, straining out the seeds. If you are using fresh berries, use a food processor or immersion blender to process them and then strain. Add the egg whites and eggs to the bowl with the dry ingredients and whisk well to blend. Stir in the raspberry puree and lemon juice until smooth. Pour the mixture over the crust and bake until the center is just set and not longer jiggles when gently shaken, about 35-40 minutes. Allow to cool to room temperature. Cover and chill for at least 2 hours in the refrigerator. Use the parchment paper to lift the bars out of the pan. Place on a cutting board and slice into bars. Dust the tops with powdered sugar. Enjoy!